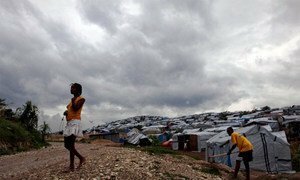 Hurricane Irene has left impoverished Haiti relatively unscathed, with only isolated damage from flooding and no widespread serious emergencies in a country that is still struggling to recover from last year’s devastating earthquake, the United Nations reported today. Irene is gaining strength as it approaches the south-eastern Bahamas but is losing its capacity to threaten northern Haiti, with rains there expected to decrease during the day. The “red alert” which Haitian authorities issued for the entire country has been lifted, although an “orange alert” is still in force in three northern departments, the UN Office for the Coordination of Humanitarian Affairs (OCHA) said. There are isolated areas of damage in the northern regions, but OCHA has deactivated the emergency joint operation centre it was coordinating. The UN Stabilization Mission in Haiti (MINUSTAH), meanwhile, is keeping its regional crisis management centres active until local authorities and humanitarian actors decide they are no longer needed. Shipping activities are still interrupted but international and domestic flights have resumed. Only one of the more than 160 evacuation sites has been used so far, by 500 people, and some roads have been cut by landslides. MINUSTAH, which has been in the country since mid-2004 after then president Jean-Bertrand Aristide went into exile amid violent unrest, had put some of its nearly 12,000 peacekeepers on emergency standby in case they should be needed for rescue operations. Haiti, the poorest country in the Western Hemisphere, is still struggling to recover from the devastating 2010 earthquake that killed more than 200,000 people and displaced 2.3 million others, and from Hurricane Tomas, which caused widespread flooding in November, unleashing a cholera epidemic that killed hundreds and infected some 20,000 people. United Nations staff in Haiti have activated their emergency response systems to prepare for tonight’s expected arrival of Hurricane Irene as it crosses the Caribbean region.